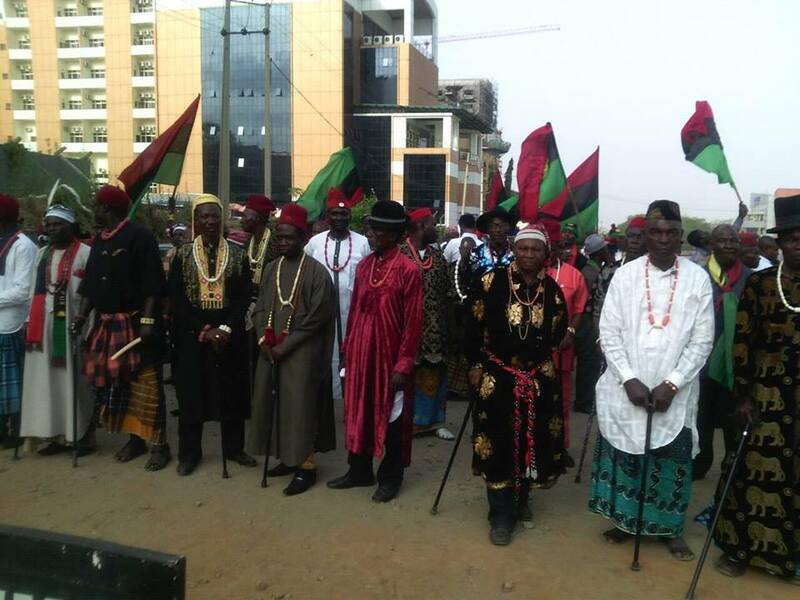 IPOB simply means the indigenous peoples of Biafra, which means that IPOB is made up of Biafran peoples. The Biafran flag is a combination of colours like red, black and green with yellow rising sun on the black. The sun has eleven fingers, which describes the eleven tribes that make up Biafra land. Where there are eleven tribes that make up Biafra, how proper is it to think that Biafra or IPOB is Igbo affair? Igbo is just one of the languages spoken in Biafra Nation. Some of the different tribes that make up Biafra are; ijaw, izon, ishekiri, Ibibio, igbo, iganke, igala, igede, idoma and others. These different tribes have their particular languages which they speak. The conception that Biafra / IPOB is an Igbo affair is false and totally unacceptable. When Britain came into Biafra land with their amalgamation, they introduced their divide and rule and deceived the world by telling them that some Biafran states were not Biafra. The question is if they are not Biafran states where are they from then? Arewa or Ododuwa? The nation of Biafra has been in existence long before the British government's creation of the place later called Nigeria. Ifegwu L. Ezeikpe (2016) noted that it is worthy of note that Biafra is a long-standing kingdom in the continent of Africa. Covering eastern region of the geographic space later called Nigeria. According to Ifegwu, L. Ezeikpe (2016) "The kingdom of Benin was the closest neighbor of the nation of Biafra. Biafra is the habitation of the ancestors as well as descendants of Biafrans. Biafran people have lasted for hundreds of thousands of years. Biafra lost her nationhood following the arrival of Britain in this country known today as Nigeria. When they came, they forced different ethnic groups including the nation of Biafra into becoming one country. Each of these ethnic groups was located in one of the three self-governing nations including, oduduwa nation, arewa nation and Biafra nation. These three nations were forced by Britain to become one country called Nigeria. Today Biafrans are asking for their freedom. The freedom of Biafra is not debatable and the restoration is a must. There is no going back, Biafra must be free. This is very accurate, but let add some of the missing ones, Urhobos, Isokos, and the Efiks, mean that izon have to be deleted since it is the same as ijaw.